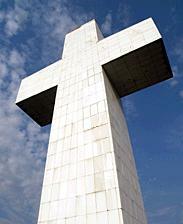 The U.S. Supreme Court this week refused to hear a challenge by an Illinois atheist to the use of public funds to renovate the 111-foot-high Bald Knob Cross of Peace on the highest mountain in Southern Illinois. The court never considered the merits because Robert Sherman was found to have no standing to bring the lawsuit. I have previously written about my opposition to the Supreme Court’s narrow definition of standing — rulings that effectively insulate some constitutional violations from review as in our lawsuit against the Libyan war. Sherman sued in August 2010. The Illinois Department of Commerce and Economic Opportunity gave a grant of $20,000 to Friends to the Cross, Inc., for the replacement and installation of exterior panels of the cross. This grant came out of a $5 million legislative appropriation to the Department. While people can disagree on what constitutes the establishment of religion, the case certainly raised an obvious question of separation of church and state. Had the court ruled that this was not establishment, one could accept that there are good-faith reasons for such a view even though some of us have a more robust view of the separation of church and state. However, the denial of this lawsuit on standing shows how this doctrine has served to insulate an expanding number of alleged violations from any judicial review. The courts have also made it difficult for legislators to sue in such cases. First, the taxpayer must establish a logical link between that status and the type of legislative enactment attacked. Thus, a taxpayer will be a proper party to allege the unconstitutionality only of exercises of congressional power under the taxing and spending clause of Art. I, § 8, of the Constitution. It will not be sufficient to allege an incidental expenditure of tax funds in the administration of an essentially regulatory statute . . . . Secondly, the taxpayer must establish a nexus between that status and the precise nature of the constitutional infringement alleged. Under this requirement, the taxpayer must show that the challenged enactment exceeds specific constitutional limitations imposed upon the exercise of congressional taxing and spending power and not simply that the enactment is generally beyond the powers delegated to Congress by Art. I, § 8. Flast v. Cohen, 392 U.S. 83, 102-103, 88 S. Ct. 1942, 20 L. Ed. 2d 947 (1968). In this case, the first prong was not met because the lower courts found that the grant bestowed to Friends of the Cross was made by the executive branch, and not the legislative branch. Thus, the general appropriation was not an express congressional mandate or a specific congressional appropriation. The artificiality of this test is made plain in this case. There is a legitimate question raised here of entanglement. Yet, it is hard to imagine who could sustain a challenge to secure judicial review. A maxim of our legal system is ubi jus ibi remedium (where there is a right, there must be a remedy). Standing increasingly says that there is no review, let alone a remedy, for some rights. designated approximately my problem. You’re wonderful! Thanks! This is absolutely disgusting. Get your hands out of our pockets!! I believe that this cross is lighted and is visible at night from the Mississippi. Is that true?